Benjamin Moore and Behr are both quality paints definitely worth your money, but when compared, which of these two is the better choice? It really depends on your personal preferences. However, before you can make an honest choice, you’ll want to fully understand the pros and cons of Benjamin Moore and Behr. Benjamin Moore is sold at a wide variety of paint and home improvement stores and offers their customers three common kinds of paint, semi-gloss, flat, and eggshell. These paints are designed for both residential and commercial projects. They’re durable, splatter resistant, easy to spread, and are fast drying. All of Benjamin Moore’s paints are cost-effective except their Regal paint which is a higher quality product. This luxury paint runs around $50 a can, but it’s definitely worth the money. It can cover a wall or ceiling a wall in 2 coats or less and looks amazing once the paint has fully dried. 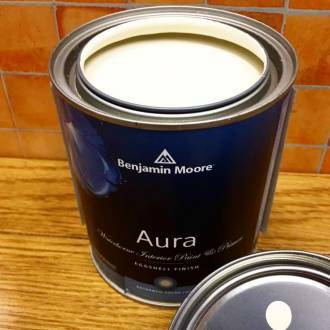 Even better than Regal is Benjamin Moore’s Aura. This paint has the best hide out of all their products and is the most durable too. Aura is very comparable to Behr Marquee. If you have children, you can feel confident knowing that Aura paint can be washed multiple times to remove grime, dirt, and stains. It’s durable, offers great coverage, and the paint will never fade or rub off no matter how many times you wash it. Behr is only sold at Home Depot stores throughout the country and offers their customers a very limited selection. In fact, Behr only has 3 premier products. They include Behr Premium, Plus Ultra, and Behr Marquee. 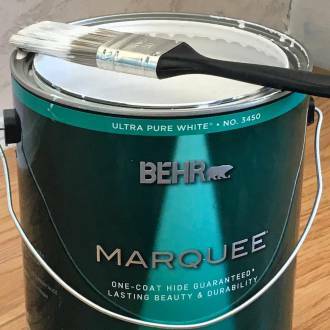 Marquee is Behr’s luxury paint and like mentioned above, it’s very comparable to Benjamin Moore’s Aura paint. Marquee is durable, easy to spread, has great coverage, and has an amazing hide. The only drawback to Marquee paint is the limited selection. You’ll have to pick from the Behr Marquee Collection. Those individuals who are interested in a specific color that’s not included in the Behr Marquee Collection should use Behr Premium Plus Ultra. You’ll have a much wider selection of colors to choose from, and you can even create your own color combinations. The only downside is that you’ll have to apply more than one coat to successfully cover a particular surface. That’s the only difference between Marquee and Premium Plus Ultra, the amount of coats it takes to cover a given surface. The best part? Behr Premium Plus Ultra paint has primer mixed in for your convenience. Consumer Reports, a media outlet that evaluates different products, compared Benjamin Moore and Behr paint to see what the better product was. According to their evaluation, Benjamin Moore beat Behr by just a little as the top-performing interior paint, and they did this by beating Behr in 2 out of the 3 categories. However, Behr beat Benjamin Moore when it came to the category of value. Volatile Organic Compounds (VOC’s) are toxins that are commonly found in a variety of paints. These compounds can cause health problems like respiratory issues and can contribute to air pollution. In California for example, paints sold in stores and online are not allowed to have more than 50 grams of VOCs per liter. Nearly all of your top-rated paints have little or zero VOCs. In fact, it’s becoming the norm. Most companies have at least tried to decrease the amount of VOCs in their paint. Now, when it comes to Benjamin Moore, the tint used in this paint have absolutely no VOCs at all. Behr paints on the other hand have low-VOC colorants. Another thing that you’ll want to remember is the higher the VOC percentage, the harder it is to spread the paint. Paint with zero VOCs won’t wear your arm out as fast. In addition to this, paints with higher levels of VOCs also require more coats. This is why choosing a higher quality paint like Benjamin Moore or Behr is so important. Benjamin Moore paints and Behr paints are very comparable in just about every single way. However, there are a few differences. Behr paints tend to be a little more affordable than Benjamin Moore paints, yet Benjamin Moore received a higher rating from Consumer Reports. In addition to this, Behr tends to have more color options when compared to Benjamin Moore. When trying to choose between the two brands, first decide what color you want and the amount of money you have available. After that, it really boils down to personal preference. Check out: Benjamin Moore vs Sherwin Williams: Which Is the Better Paint?